A great use for the largest giant zucchini, that have a way of turning up in the garden just when you turn your back. This is a moist spice bread that uses whole wheat flour, agave and honey. You can increase the whole grain content, by reducing the white flour and increasing the whole wheat flour by the same amount. I would not vary by more than 1/2 cup or so though, or the texture will not be nearly as nice. Agave nectar is a mild tasting sweetener made from the desert agave plant. It has a lower glycemic index than sugar or honey and therefore has a less negative impact on blood sugar levels. You can easily substitute sugar for the agave though, if you don’t have it. A little grated apple is nice in this loaf (it’s always great to sneak in more fruit and veggies when you can), and if you like nuts increase to as much as one full cup. If you prefer a sweeter bread sift some confectioners sugar over the cooled bread, or dress it up with a simple sugar glaze. For muffins, bake at 375 degrees in prepared muffin tins (greased or lined with paper liners) for about 20 minutes (or until a toothpick inserted in the center of a muffin comes out clean). In a bowl, sift the dry ingredients together. In another bowl mix water, honey, sugar, agave, eggs, oil and vanilla until well blended. Stir dry ingredients into wet ingredients until just moistened. Do not over mix. Add shredded zucchini and nuts, and gently stir to combine. The batter will be thick. Bake for 50 minutes or until a toothpick inserted into the middle of the loaf comes out clean. Cool to touch in the pan before turning out onto a wire rack. Cool completely before storing. Cover in plastic wrap or store in an air tight container. 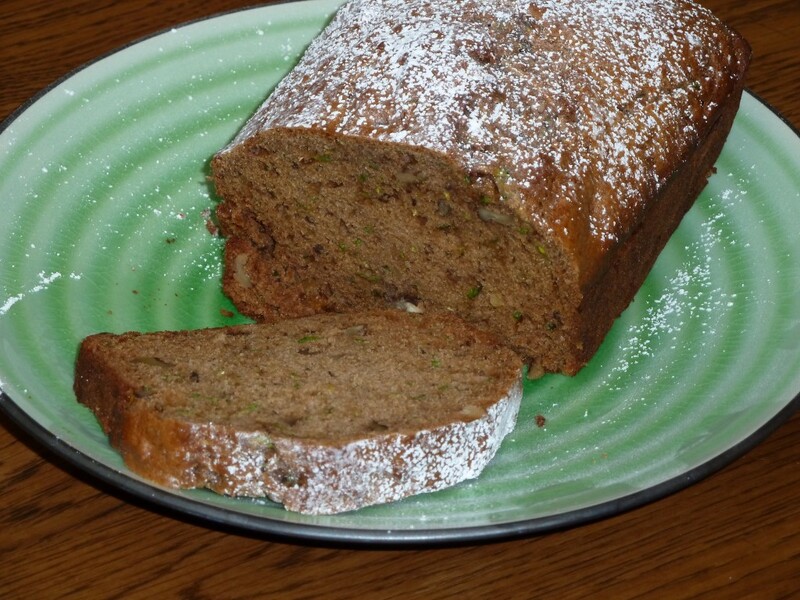 This entry was posted in Recipes and tagged muffin, zucchini by Four Cooking Together. Bookmark the permalink.